Bovada's sportsbook is packed to the brim with betting lines; in many ways, the site is the best possible option for sports betting, simply because of its remarkable quantity of choices. In today’s quick-moving and cutthroat online gambling industry, companies must truly excel to stay ahead of the stiff competition; it’s a constant struggle to retain current clients and attract new ones. However, one company—Bovada—has managed to do just that, thanks to a careful implementation of groundbreaking features, a strong commitment to customer satisfaction, and more. Let’s take a close look at each aspect of Bovada.lv, as well as what the gambling website does to remain so trusted and relied upon by bettors. For high rollers and occasional gamblers alike, depositing money into an online gambling website can be a real challenge; less reputable sites take a long time to process deposits, only accept a few payment methods, and don’t offer particularly large deposit bonuses (or any deposit bonuses at all). Bovada deposits can be made with a credit or debit card, MoneyGram payment, Western Union payment, Walmart gift card (more information is available on the site), and even Bitcoin. Deposits are reflected in one’s account balance in just a few minutes. As if quick deposits with plenty of payment options weren’t enough, the site offers quite a few bonuses for new members (each with specific requirements)—sometimes to the tune of 100%! In other words, individuals who’re new to the website can receive twice their out-of-pocket deposit amount the first time they put money in an account (by using a special promo code; be sure to secure one beforehand). For bettors, the aforementioned stiff online gambling website competition sure does have its perks! Bovada boasts a tremendous selection of online casino games as well; there’s no need to drive to a physical casino to experience the rush and fun of placing a wager. Hundreds of flashy and engaging slot machines, roulette variations, countless poker variations (including video poker), blackjack (and a variety of other card games), craps, keno, and everything in between can be fired up in just a few seconds and played at a comfortable pace. Plus, seasoned bettors can play live casino games, which capture the exact excitement of physical casinos by beingphysical casinos. Professional dealers save spots at the table for players, issue them real cards, and are broadcasted into the comfort of these players’ homes. Those who love casino games will find a lot to enjoy at Bovada. Bovada’s sportsbook is packed to the brim with betting lines; in many ways, the site is the best possible option for sports betting, simply because of its remarkable quantity of choices. Football, soccer, baseball, boxing, MMA, basketball, tennis, golf, hockey, and all the other “big” sports are included in this mix, but impressively, so too are, horses, e-sports, cricket, snooker, rugby, volleyball, racing, and much, much more. Whether an individual or team is competing in baseball in front of millions or some other sport in front of hundreds, Bovada’s remarkable sports betting section is the place to wager. 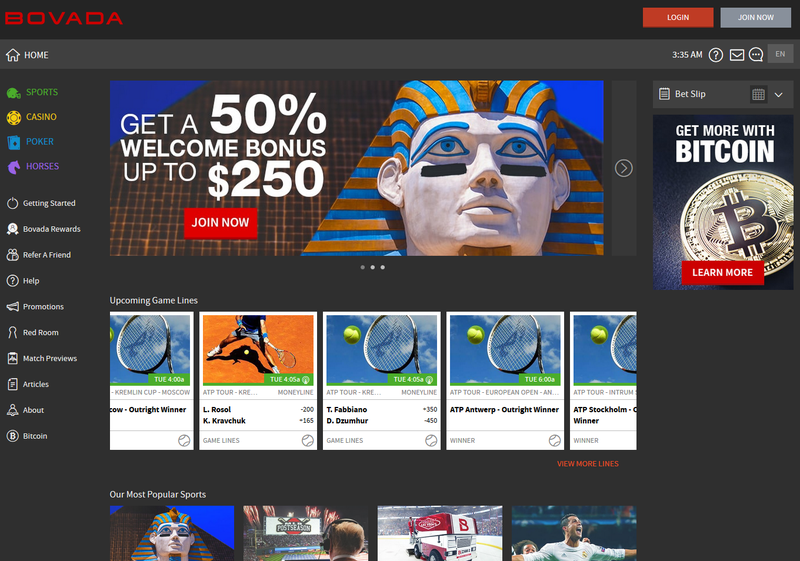 Finally, Bovada shines in two deceivingly important areas: withdrawals and customer support. Readers who haven’t experienced the frustration of struggling to take their winnings out of an online betting site, being saddled with hidden fees and delays in the process, probably can’t fathom the severity of the annoyance; and if these same individuals use Bovada, they won’t ever have to face the inconvenience. This is because the site’s numerous fund-withdrawal methods are quick, easy, and reliable, and make getting money out of the site a pleasure (as it should be) as opposed to another gamble! Similarly, the website’s customer support team is caring and attentive. The hope is certainly that one won’t have to consult this support team, but in the instance that help is needed—even with a simple question—the professionals at Bovada will be happy to assist. The bottom line is that Bovada.lv offers outstanding value, convenience, and options to bettors, and anyone who’s looking to place a bet and have a good time shouldn’t hesitate to sign up.